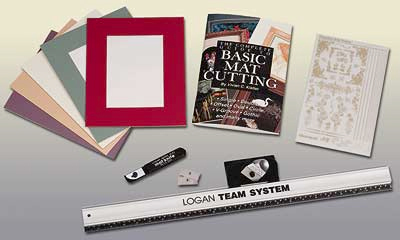 * This kit includes everything you need to cut great mats. * Includes accurate light-duty equipment: 24" Adapt-A-Rule (Logan 524), Bevel Cutting Head (Logan 302), Mat Knife (Logan 500), 64-page Complete Guide to Basic Mat Cutting book (Logan 238), ten replacement blades (Logan 270), ten pieces of practice 8x10 matboard (various colors), one sheet of decorative corner transfers, and instructions. 24" x 8.5" x 1.875"